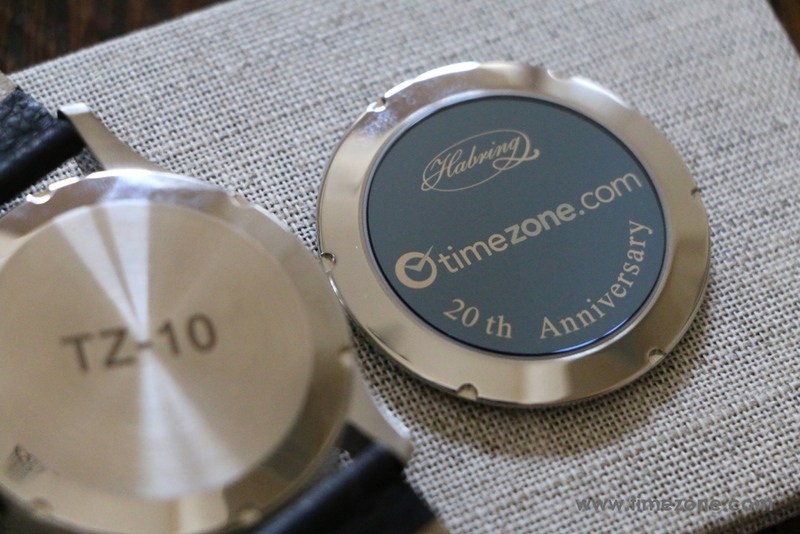 After waiting over a year and a half for its realization, it was an absolute pleasure to finally receive the TimeZone 20th Anniversary Habring² Chrono COS, ref. 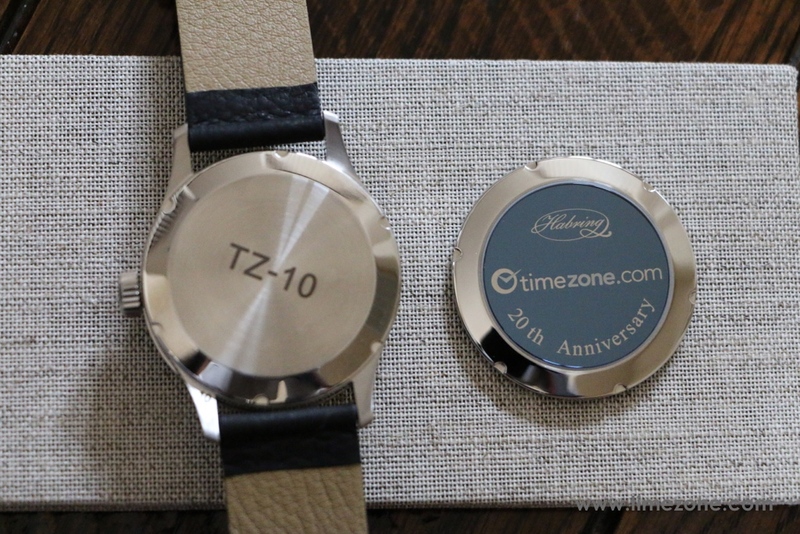 TZ20 in time for the holidays. 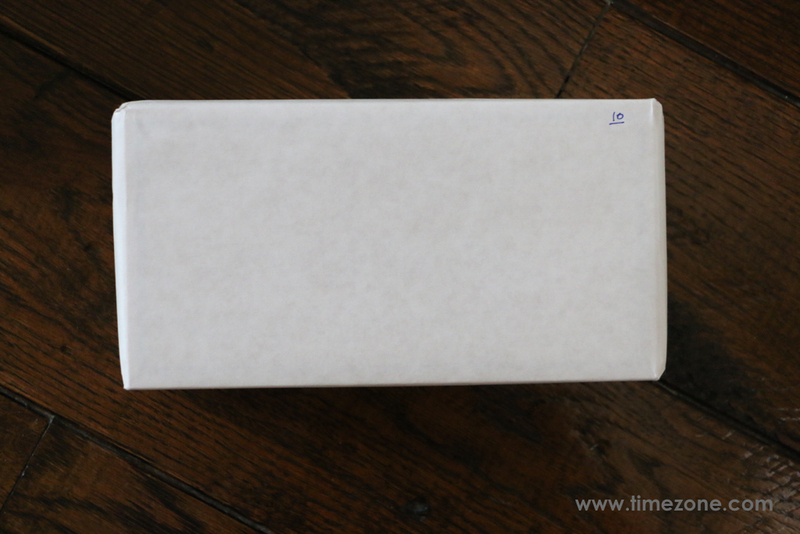 Here are some unboxing photos and impressions of the TZ20. 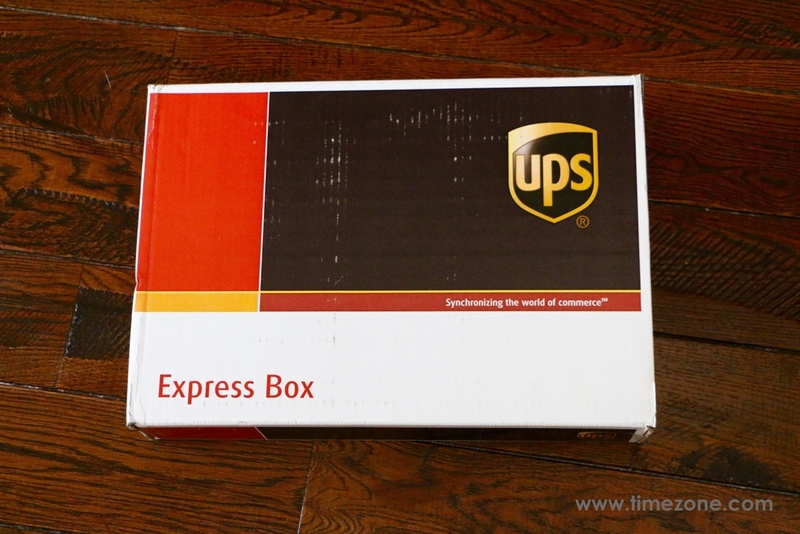 The UPS truck arrived at about 9:30 a.m. and, by 9:33 a.m., I was staring at a simple pine box. 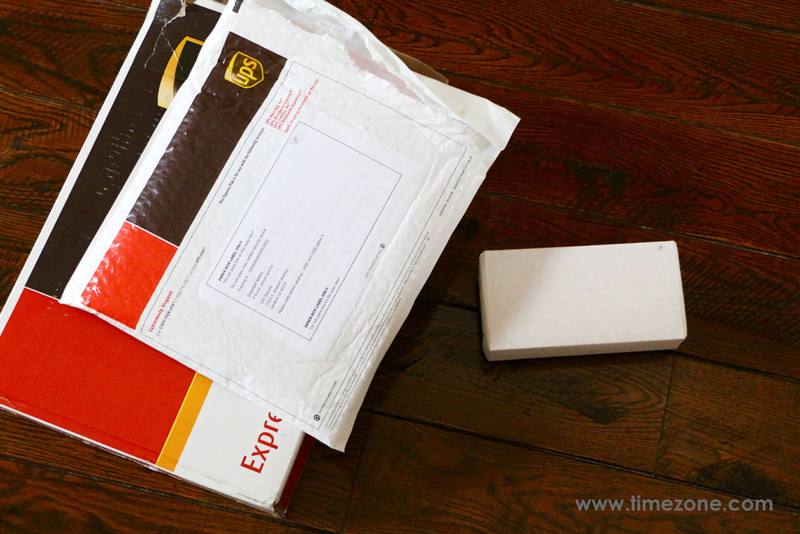 The Oregon pine box is minimalist, compact and practical. 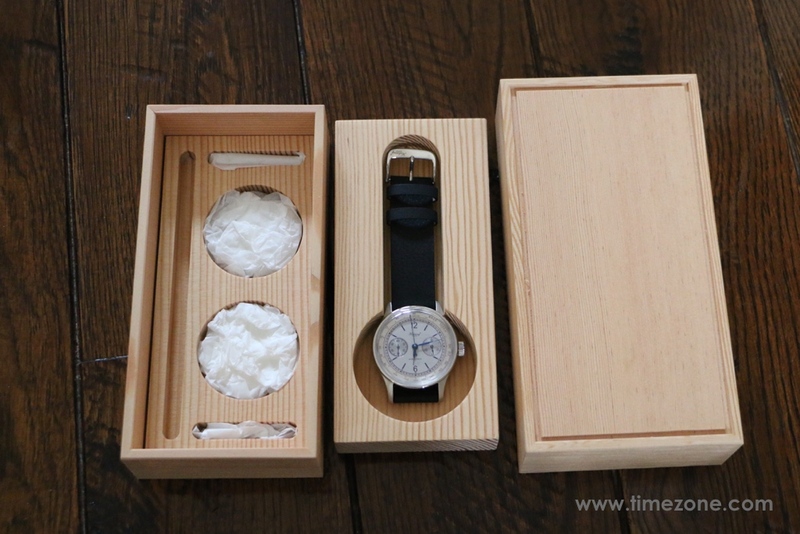 This straightforward box appeals directly to the utilitarian side of being a watch collector. 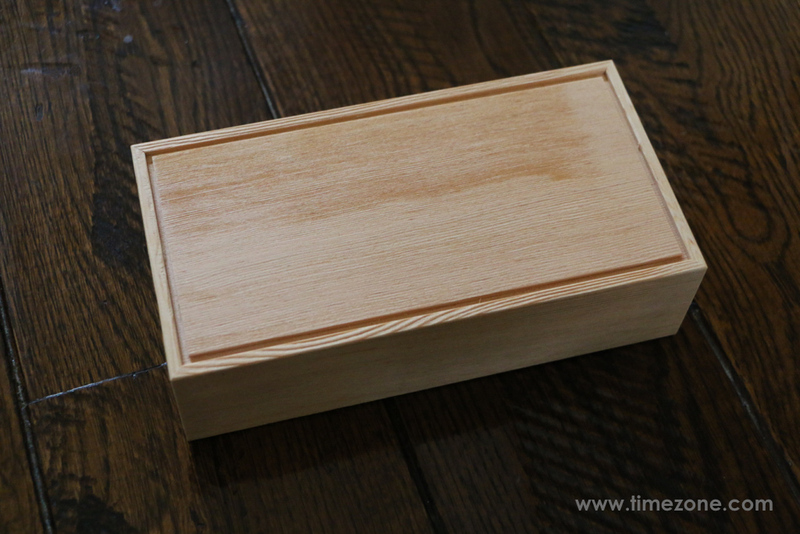 Uncovering the lid reveals one solid pinewood block stacked neatly on top of another, and each block with compartments shaped in the silhouette of its contents. 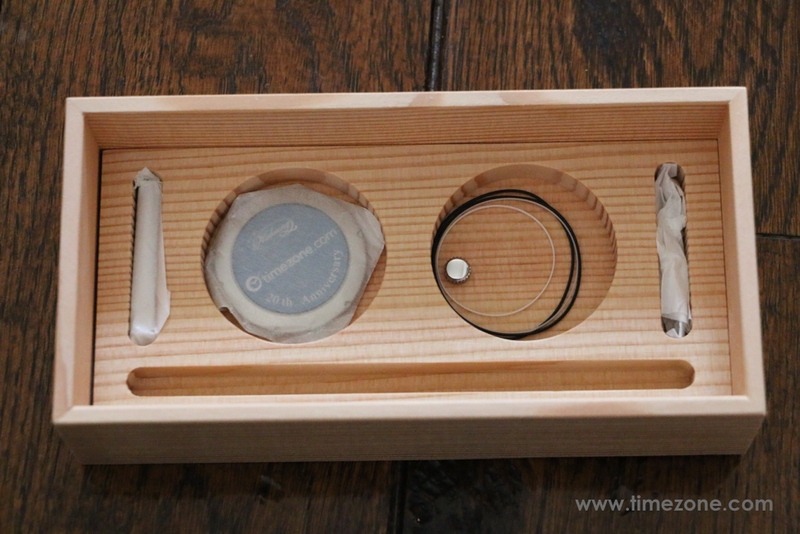 The top pinewood block is where I discovered the TZ20 nestled in a tissue cocoon. The top pinewood block stacks on another pinewood block holding the spare component parts. 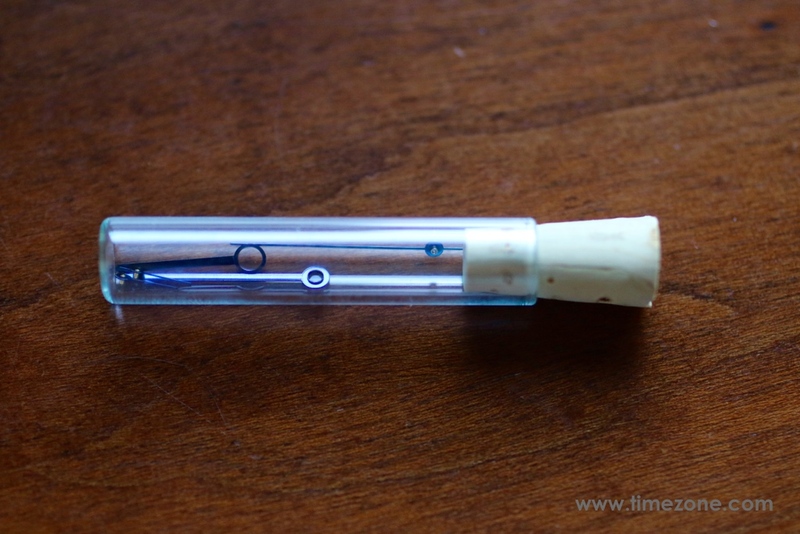 On the far left are the spare spring bars; a round compartment holds the spare caseback; another round compartment holds gaskets and seals, and a spare crown; and to the far right is a glass vial filled with a full set of spare hands (hour, minute, chronograph, seconds, counter). "Your very own Habring²... #10"
The classic, uncluttered dial is finished in four textures. The outer dial is hand-brushed and printed with a blood-red telemeter scale. A mirror-polished silvered ring separates the outer and inner dial. 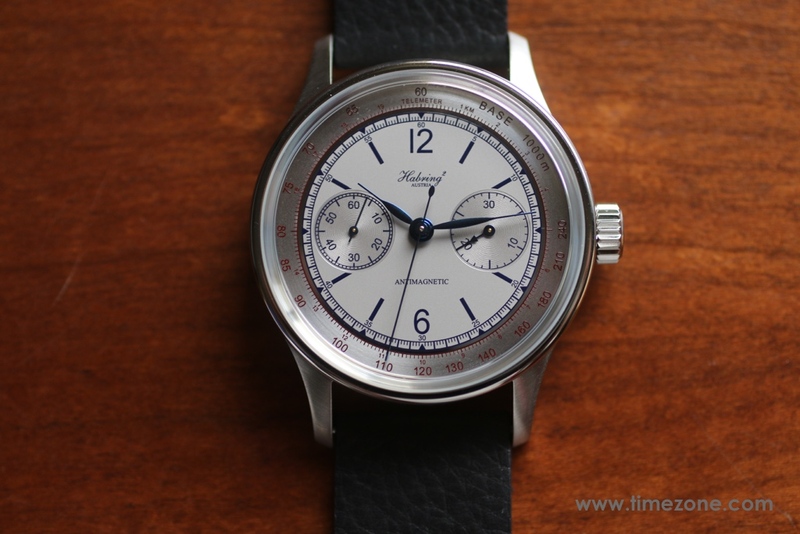 The grained inner dial is grey and crisply printed in dark navy blue. The grained finish is coated with a special filter treatment that minimizes reflections and creates the effect of champlevé enamel. Altogether, the finishing details recreate the look of a perfectly aged dial. Designing the TZ20 was a long, thoughtful process that resulted in a number of sophisticated finishing details that William Massena explains more thoroughly, here. 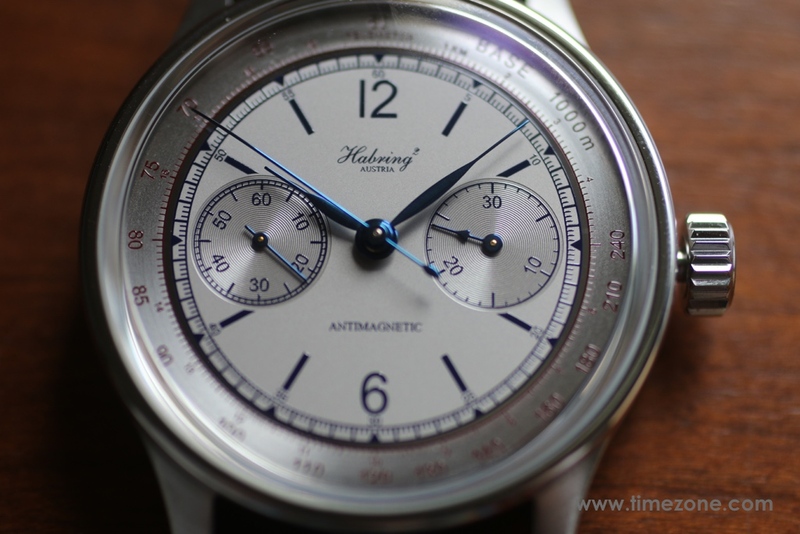 The 42mm stainless steel case is based on a three-part design made for Habring² in Austria. Since launching the Felix in 2014, Habring² cases are manufactured to Habring² specifications by Mattig Präzision GmbH and Meislitzer Präzisionstechnik GmbH in Austria. Even the steel is produced in Austria by Böhler Edelstahl, a large Austrian company that supplies steel and special forgings to a number of important watch brands. The cases are then finished to Habring² specifications in Weimar, Germany. All components like the seals, the double-sealed crown, and even the sapphire crystals result in a water resistance of up to 50 meters. Each TZ20 carries a unique serial number on the left lug to match its case back. The unique translucent blue and silver "20th Anniversary" sapphire crystal caseback is rather new to the watch industry, having only been done once before for an obscure $55,000 Bulgari Octo chronograph for Maserati. 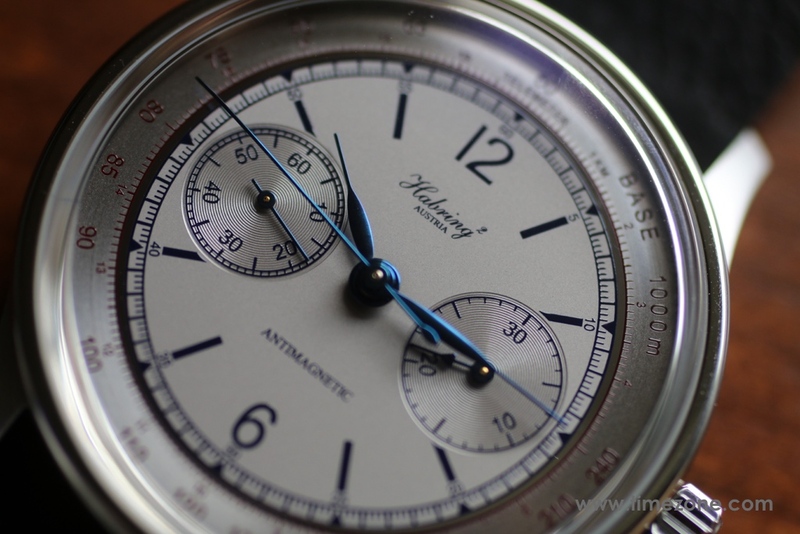 Habring² introduced its Crown Operation System (COS) chronograph in 2008. The COS chronograph is inspired by a rare and classic Swiss chronograph from the 1950s, and an exemplar is catalogued in the British Museum collection. The idea behind this elegant system was a stealth chronograph design that eliminates conventional pushers for the start, stop, and reset operations. In other words, in lieu of two-pushers or a mono-pusher design, simply turning the crown actuates the start, stop, and reset operations. 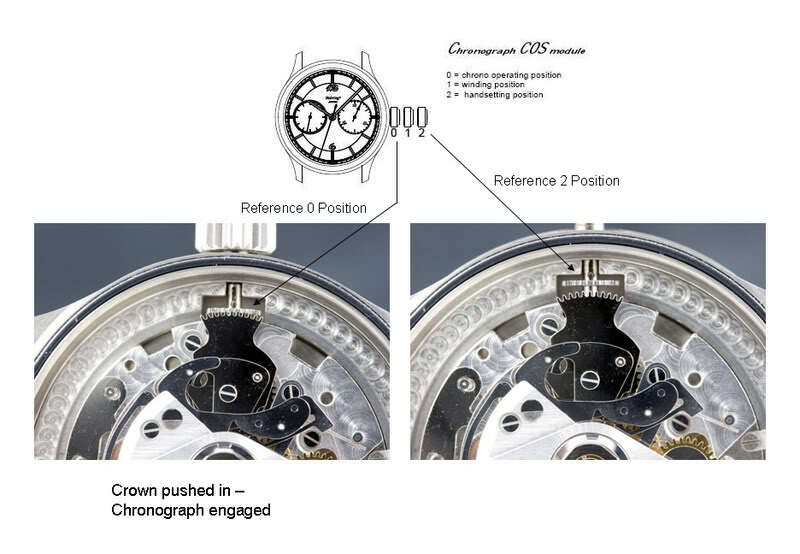 When the crown is in its normal zero position, the chronograph is engaged. 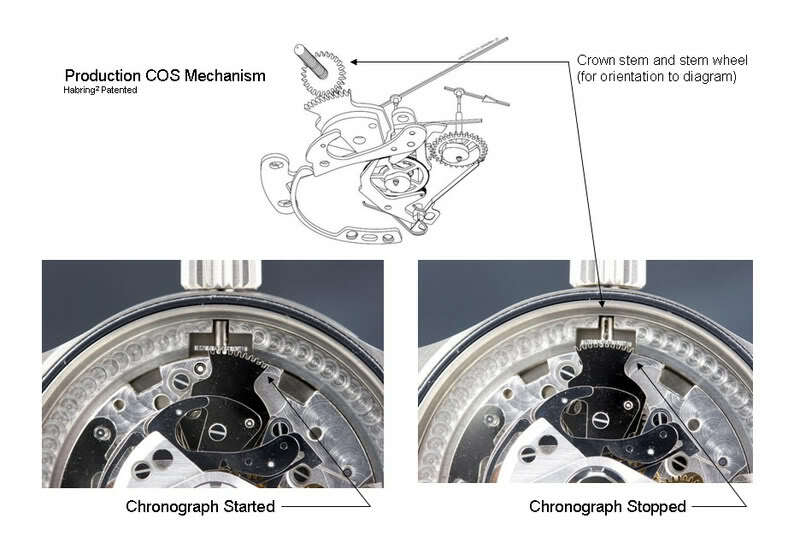 A 45° rotation of the crown counterclockwise results in an audible click and immediately starts the chronograph. 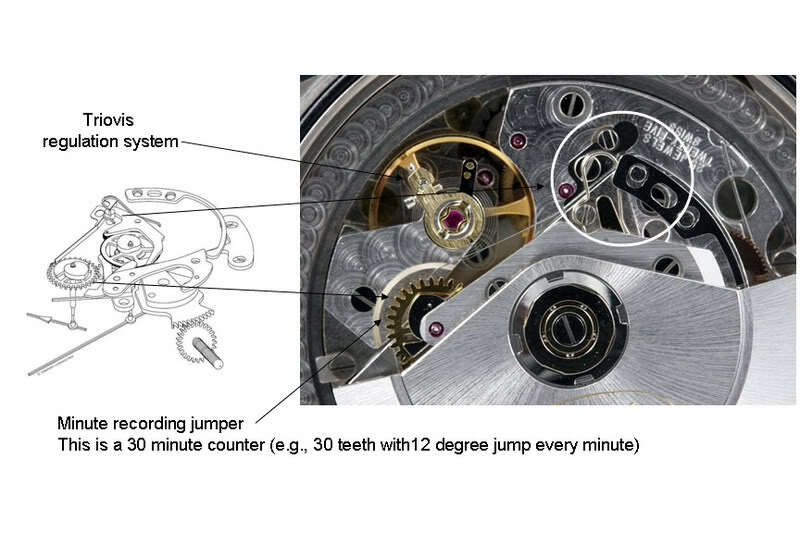 A 45° rotation of the crown clockwise results in an audible click and immediately stops the chronograph. 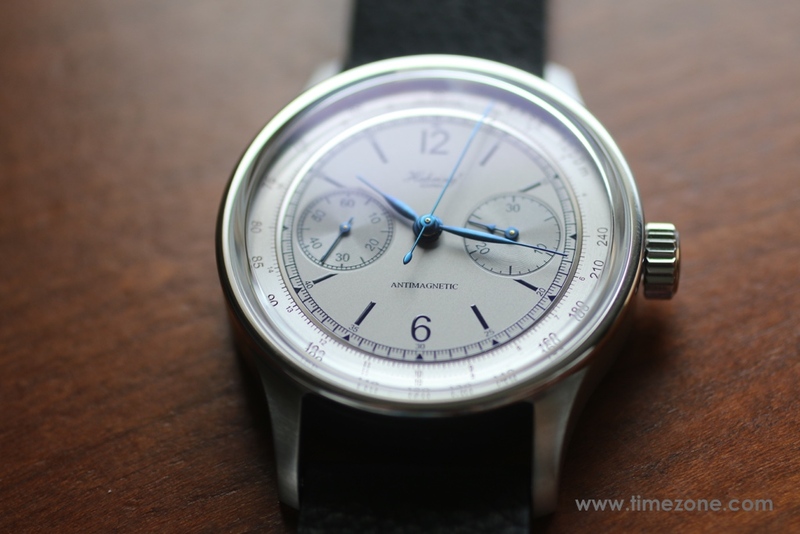 The chronograph can be restarted and stopped as desired, without resetting. 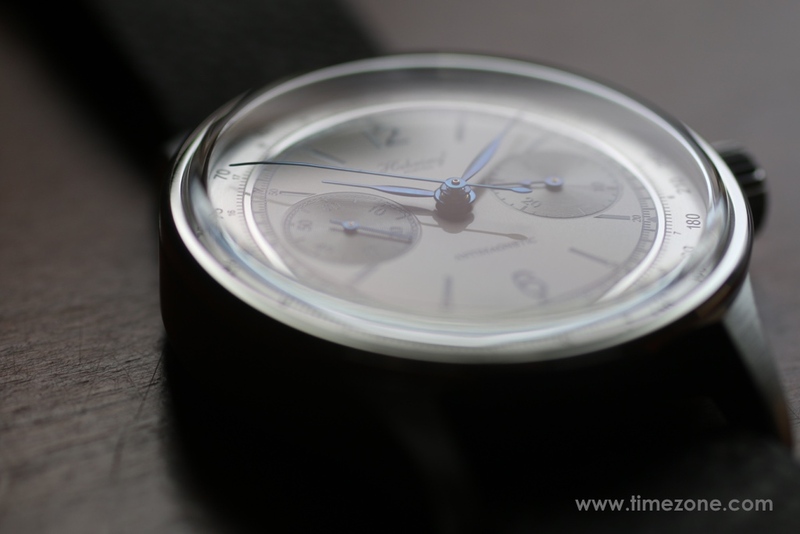 Not only are these 45° rotations silky smooth, but the chronograph hand starts instantly without any tiny jolts. 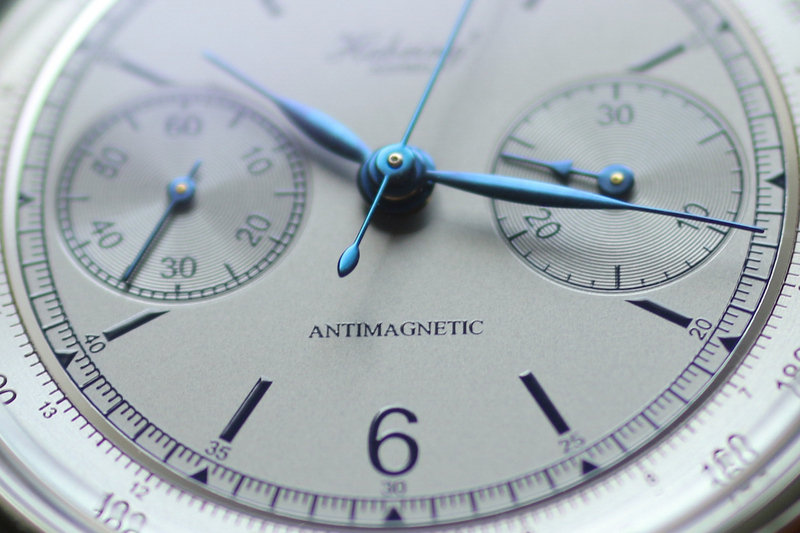 A firm rotation 90° clockwise resets the chronograph hand to zero. 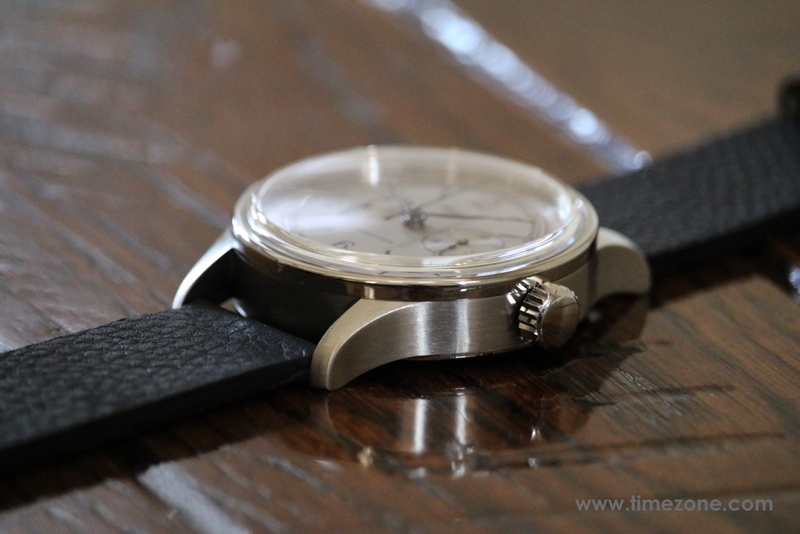 To avoid any issues of over-rotation, the movement is designed with banking elements on the frame. Winding the movement is done with a short pull of the crown to position 1. Setting the time is done with a long pull of the crown to position 2. 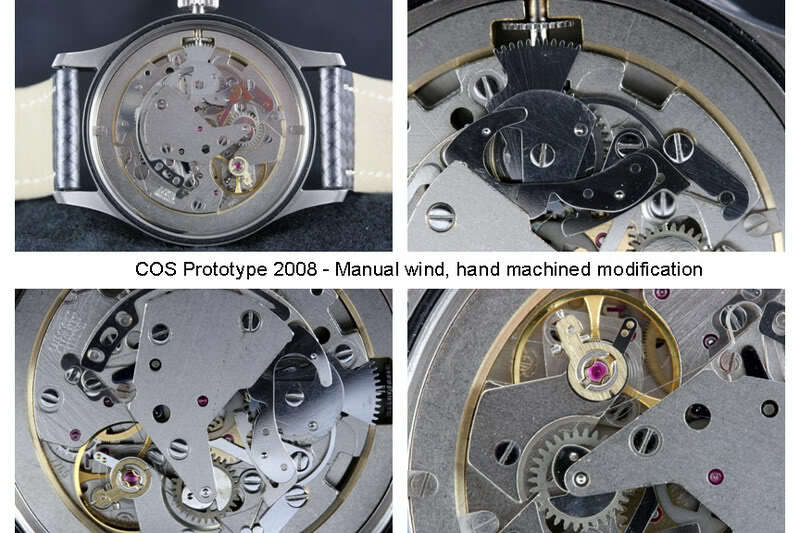 Although chronograph mechanisms are varied, there are two main types depending on whether the control arbor is a column wheel or a cam. Conventionally, the functions of the chronograph mechanism are activated using two pushers that act on the control arbor via a driving member. In a column wheel chronograph, the driving member is a toothed plate. In a cam chronograph, two shuttles make up the cam, with both shuttles forming both the control arbor and the driving member. One of the pushers acts on one shuttle so that its movement activates the start and stop functions; whereas, the other pusher acts on the other shuttle so that its movement activates the reset function. In a monopusher chronograph, all of the chronograph functions are performed by a single push-piece. The pusher acts on a column wheel and the control member is adapted to control the start, stop and reset sequence. Generally, this single push-piece is housed in a control arbor and protrudes from the crown. 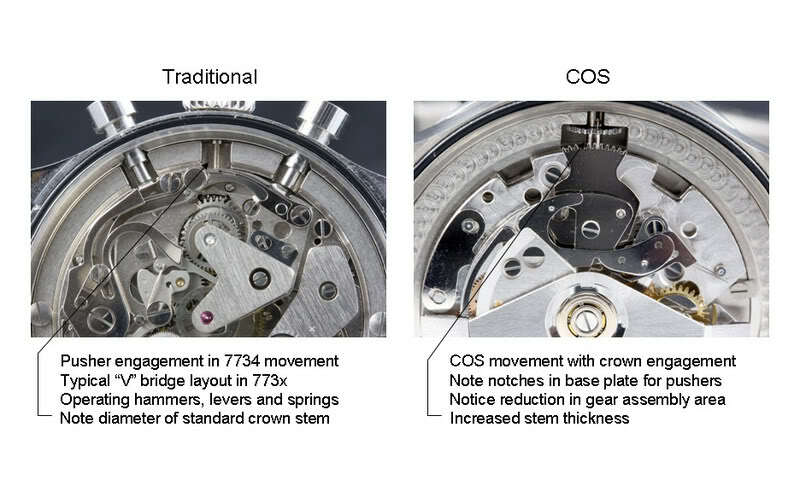 The crown usually performs the setting and winding functions of the movement, independently of the chronograph. The winding is done in position 0 of the control arbor, and the setting is done in position 1 of the control arbor. 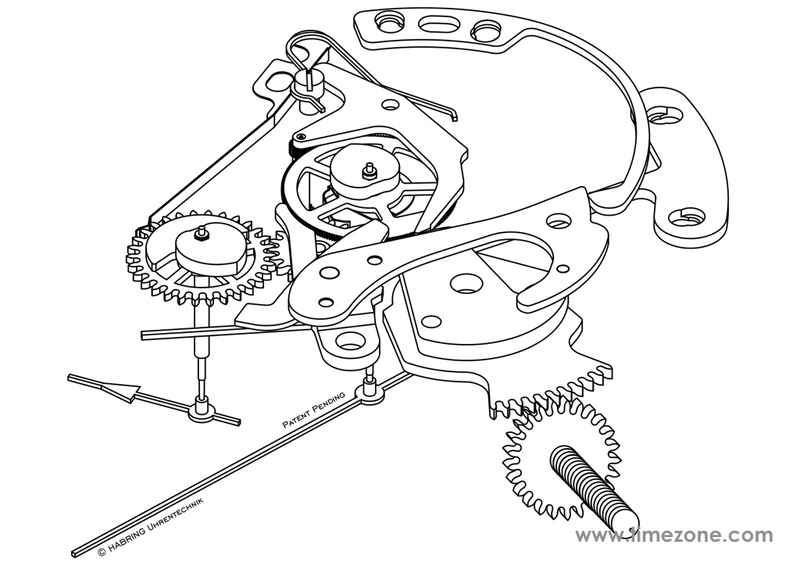 Notably, in conventional chronographs described, above, bulky levers with sometimes complex forms are inserted between the control stem and the driving member. Whereas, the COS construction altogether eliminates the need for a lever between the control stem and the driving member. The caliber A08 hairspring is precision engineered in chronometer-quality with a Breguet terminal curve by Carl Haas GmbH in Schramberg, Germany. The hairspring is manufactured from PE3000, an antimagnetic alloy that is self-compensating and corrosion resistant. While Carl Haas supplies the high-grade hairspring, Habring² then correctly mounts, bends and hand-adjusts the hairspring at its atelier to achieve chronometric results. This is a formidable task that requires both skill and patience. Indeed, the operating results achieved by my TZ20 are excellent with a tested accuracy of +2 seconds in six positions. 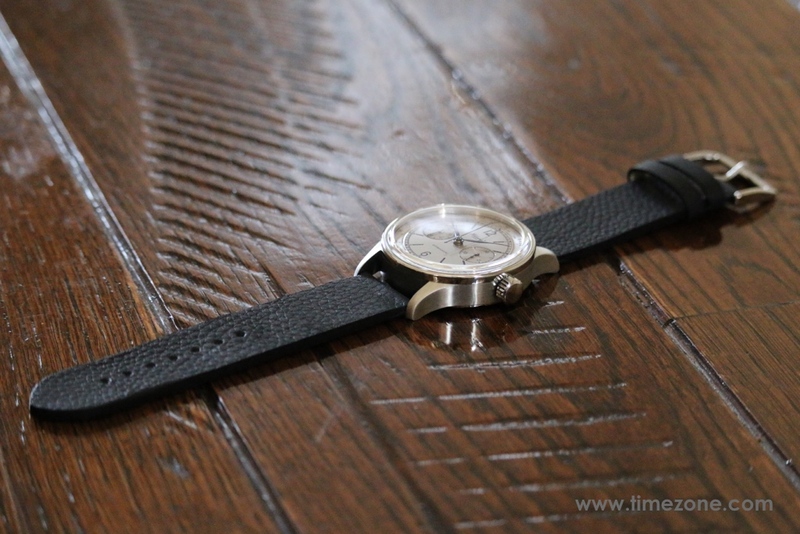 The thick deerskin strap is so supple that it lays completely flat. 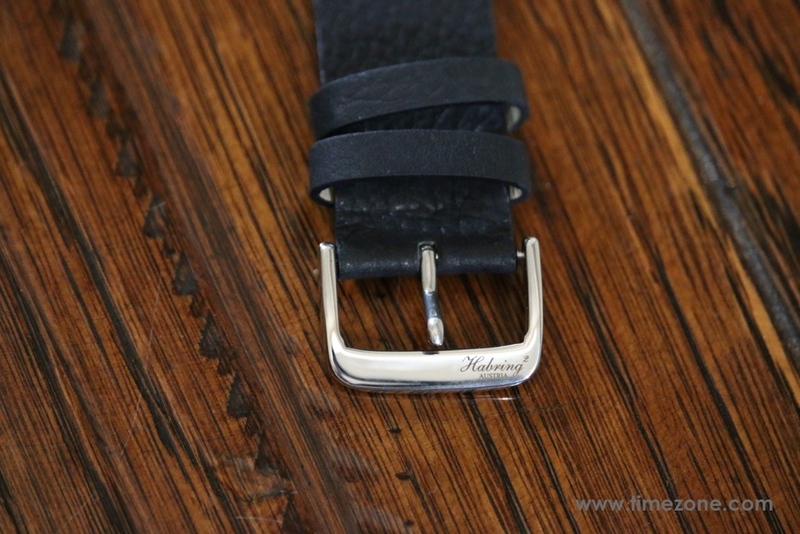 Although it looks simple and utilitarian, the bespoke strap went through a number of proprietary processes to achieve its supple softness so that it doesn't require a break-in period. The strap is even waterproof. Now that I have the final execution in hand, all I can say is that Maria and Richard Habring exceeded my expectations and did an amazing job realizing the vision that William spent over 1.5 years designing and refining. Everything about the TZ20 is special and timeless, including the TZ20 dial, the COS chronograph movement and even the strap. 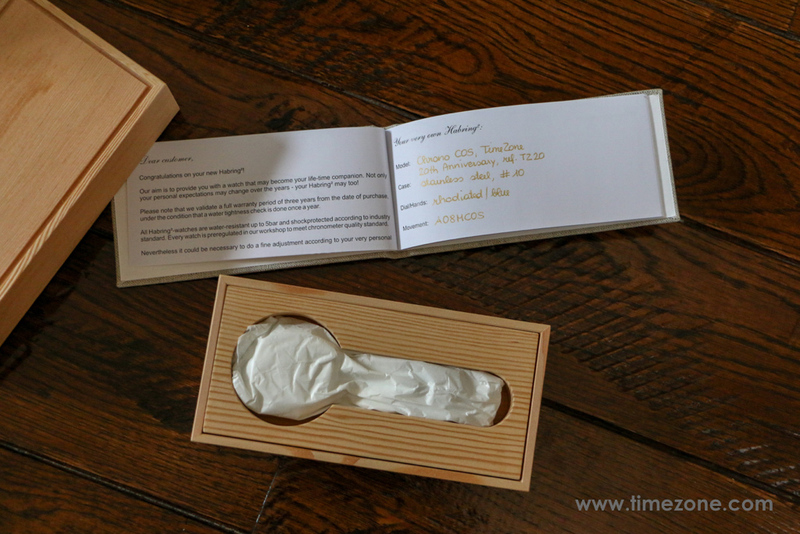 It's one thing to handle a prototype, look at photographs and pour over renderings. 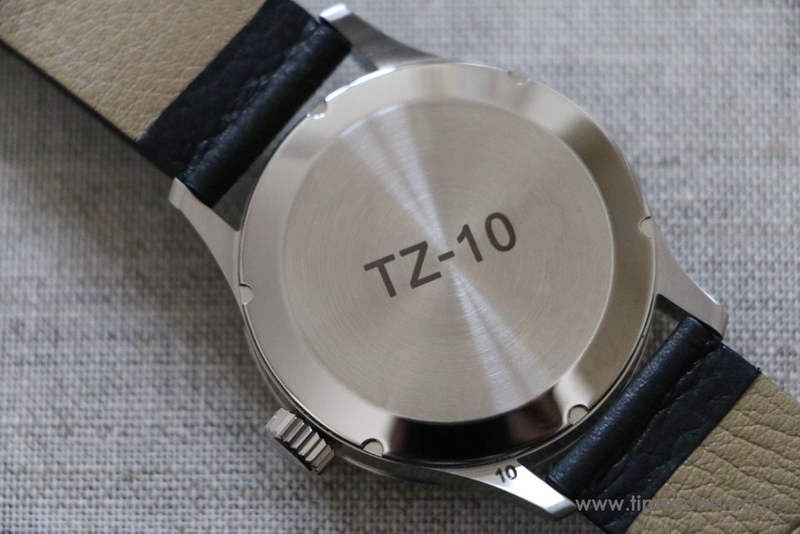 But to finally wear the completed TZ20 on my wrist is entirely satisfying. Next Topic: How does a Parmigiani or a Roger Dubuis hold up compared to other hig end watches?